Hambach forest in Germany is 12,000 years old. But less than a tenth of it remains, and the remainder is under threat from ever expanding lignite coal mining. Lignite ('brown coal') is even more climate polluting than black coal, and the vast mines scar the landscape, swallowing up forests and villages. 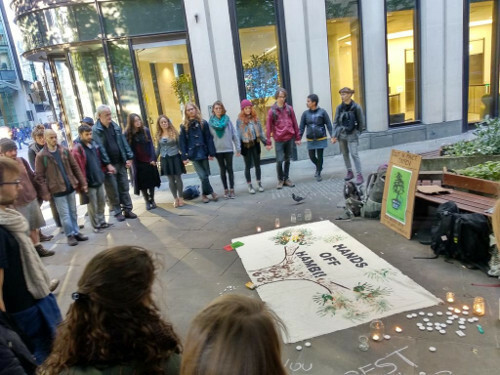 Those who took up residence in the forest, and those who support them, are drawing a line for the forest and for our climate: no more - Hambi Bleibt (Hambi stays). But in their eagerness for profits, energy company RWE are not willing to wait for the outcome of a commission on quitting coal, they want protectors evicted to raze the forest. Police went in with disproportionate force, and were intent on eviction. Then on Wednesday 19 September, journalist, blogger and activist Steffen Horst Meyn, fell to his death from a suspension bridgewhile attempting to document an ongoing eviction action. You can read more about the circumstances here. A few days later, the evictions continued. "We were never given time to mourn"
This tragedy has been felt internationally, raising awareness of the destruction Steffan was bearing witness to. A petition to the German government to block the forest clearance has reached over 750,000 signatures. Sign here. 'We come together in solidarity today for our friend & climate comrade Steffen who lost his life on Wednesday after falling from a tree bridge during the dangerous eviction of Hambacher forest. We express our heart felt condolences to Steffen's family, friends and all that are connected to the struggle of this tragic accident. But it's also a somber reminder that the state of the world is in such peril and repression so fierce that we're forced to put our bodies at extreme risk to fight for a better world, for it's too important not to. Steffen knew, lived and died by this. As climate breakdown fuelled by the likes of RWE claims lives across the world every day, we must continue to fight. Climate change is real, CO2 is poisoning our planet and it wont stop unless the phase out of fossil fuels happens immediately. Its time to pull the plug on lignite coal mining. Stop putting profit before people and the earth! 7000 attended a recent protest and an action has been called for 6th October in the forest. There will also be a mass action against lignite coal mining 25-29 October, organised by Ende Gelände. If you would like to travel to Germany at the end of October in company with other UK activists to take part (you can participate in the direct action or in a support role), contact info@reclaimthepower.org.uk to link up with others.